For a week filled with chocolate shades, it seemed only fair to include my favorite favorite sweet treat, too! San Francisco sweet shop Miette turns out the very best pastries, in my humble opinion–never too sweet, they're adult in the most delicious sense of the word. So when John picked up their scrumptious (and darling) cookbook as a Valentine's Day gift, this was the very first recipe I tried my hand at. My bag technique still needs work, but I thought you all might want to try out this sinfully delicious confection yourselves–the recipe for the cake, and all the various buttercreams, can be found here on Bakerella! Considering it is 100 degrees in the northeast, I don't think I can process turning my oven on. But, I will bookmark this deliciousness until the weather turns nice again. Now I know where I'll be heading the next time I'm in the bay! ;) Nom nom nom. Holy baking job...that is the most perfect cake I've ever seen! Oh wow...that looks sinfully delicious! Good job, lady! Beautiful! Mine would never turn out like that! Looks scrum-diddly-dumptious. That word makes less sense when you're trying to type it. . . So lovely! I'm not known for my kitchen talents- I'm sure mine would be a big, fat mess! Great job on the cake, it's beautiful! I'm looking forward to trying it too! I saw this photo and squealed, "MIETTE!" I love that place. We need to meet up there! YUM!!! My favorite...Making a chocolate cake Sunday for my birthday boy!! holy yumminess! This looks so so delicious. 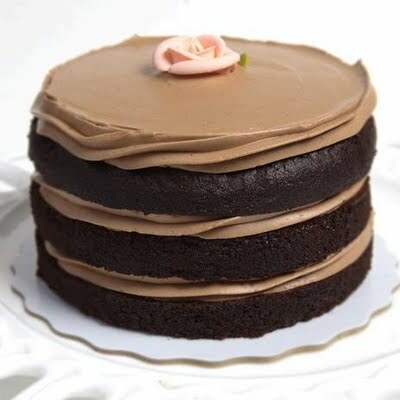 I am trying to stay away from sweats before my summer vacation but I cant resist chocolate cake. this is what I need,now! thanks for sharing the links!!! Holy smokes! I could bite my screen now! miette is on my list of bakeries to visit someday! was the recipe really good? OMG. Lena, you are killing me... that looks amazing. Screw kale and quinoa I have to make this thing! That looks AMAZING! I want this as my wedding cake. I LOVE LOVE LOVE Miette! We got the cookbook last year and I think my sister made this same cake and it was so delicious! Sometimes the title makes the image. Have I ever told you how brilliant I think you are? Oh gosh, that cake looks heavenly! It's 8 am and I wish this was my breakfast!!! Have a nice one!